Acadian Genealogy Homepage; Privacy & Security Statement! The webmaster of this Acadian Genealogy Homepage maintains an Online Address Book of names and e-mail addresses. If you place an Online Order requiring payment, your billing address, and in some cases, your telephone number are also retained. This information is used to process your order and, if necessary, to contact you regarding the status of your order. With your permission, this information may be used to contact you for promotional purposes. I do not share your customer contact information with third parties for promotional purposes, and would only do so with your prior approval. If you do not want to be contacted for promotional purposes, merely send an e-mail requesting removal from my Address Book. I reserve the right to cooperate with law enforcement officials in the investigation of alleged unlawful activities of our customers related to electronic communication and, in such instances, will accept no legal liability for such disclosures. While I carefully select the Web sites to which I link, I am not not responsible for the privacy and security practices or the content of these Web sites. Shopping online is extremely safe, secure and convenient. Not a single customer has ever reported the fraudulent use of credit card information used to process Online Visa transactions. A "secure server" ensures that no one (except our mutual banks) see the details of your transaction. "SSL (Secure Socket Layer) technology is used whenever submitting private information, including credit card and other billing data. SSL uses a complex encryption process to ensure that all communication is kept private. It's easy to tell when you are protected by encryption - the lock or key at the bottom/top of your browser changes color or is no longer broken. This may vary depending on your browser. 1. Authentication - By checking your digital certificate, your customers can verify that the Web site belongs to you, and not an impostor. This bolsters their confidence in submitting confidential information. Click images above to view Site Security Certificates. 2. Message privacy - SSL encrypts all traffic between your Web server and customers, using a unique session key. To securely transmit the session key to the consumer, your server encrypts it with your public key. Each session key is used only once, during a single session with a single customer. These layers of privacy protection ensure that information cannot be viewed if it is intercepted by unauthorized parties. 3. Message integrity - When a message is sent, the sending and receiving computers each generate a code based on the message content. If even a single character in the message content is altered, the receiving computer will generate a different code, and then alert the recipient that the message is not legitimate. With message integrity, both parties involved in the transaction know that what they are seeing is exactly what the other party sent. All of these features are handled automatically and requires no action by the shopper. Credit card fraud is virtually non-existent on the Internet, but it could happen. If customers experience fraudulent use of your credit card as a result of shopping with Inex ezWare, simply notify your credit card company in accordance with its reporting rules and procedures. Most companies will either cover all of the fraudulent purchases or hold you liable for a small amount." 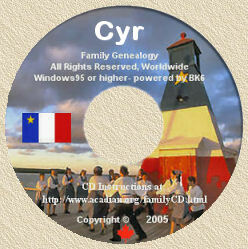 The Acadian Genealogy Homepage is the personal web site of Yvon Cyr and is intended solely for the entertainment, information and education of its viewers and visitors. I always attempt to ensure the accuracy of the information contained within these pages, but cannot assume any responsibility for incorrect or out-of-date facts or information. Viewers are encouraged to verify the information before acting upon it by directly contacting the appropriate organization or another website. Any information and/or items appearing herein that are located here contrary to the author's wishes, have been done so completely unintentionally. Please contact me so that any offending items and/or information can be removed promptly.